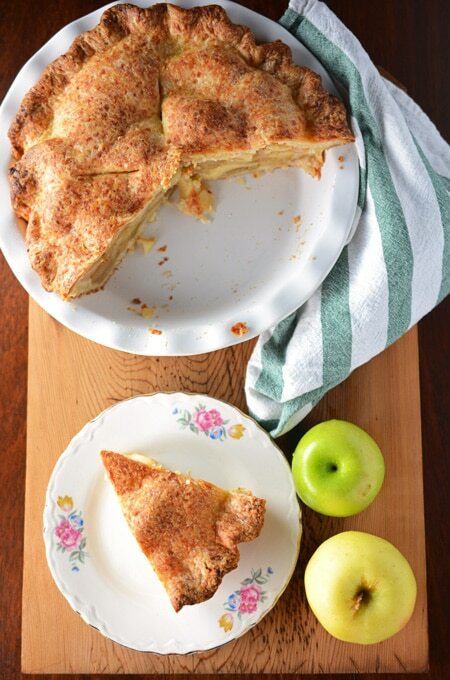 This Apple Pie with Cheddar Cheese Crust is simply beautiful! 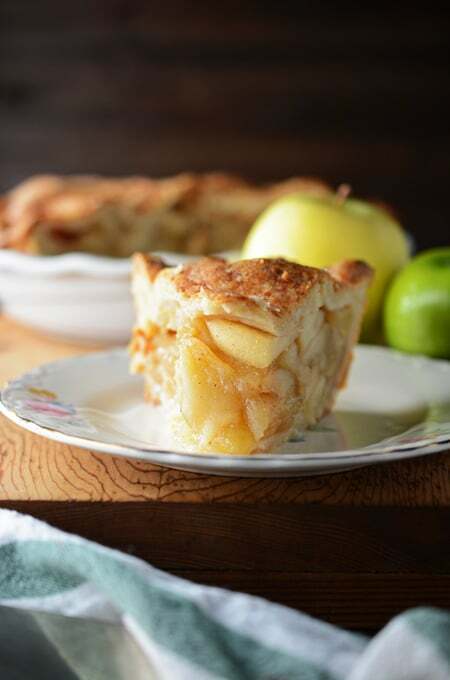 I admit I have tried for years to make pies as gorgeous as some of my cakes, but for years I had not been able to succeed….until now… well at least after finding America’s Test Kitchen and their recipes. Once I found their Foolproof Pie Dough things have been going well! You can check this pie dough out in action on this Blueberry Pie. After finding so much success with their Foolproof Pie Dough I was a little hesitant to use any other pie dough, however this cheddar cheese in the pie dough thing sounded pretty good, so I had to give it a try. The results………AMAZING! 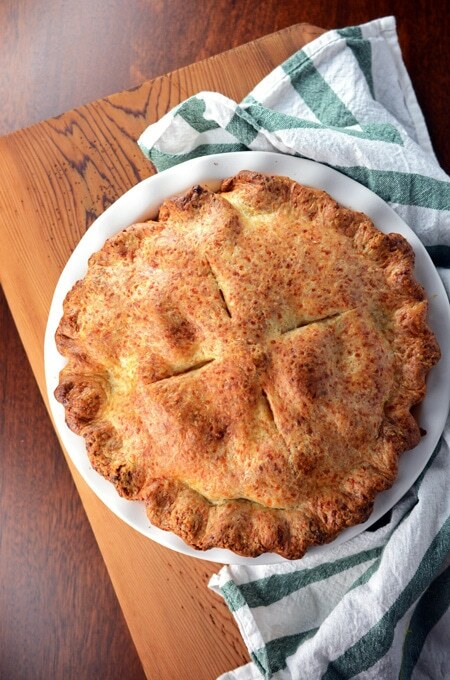 The cheddar cheese in this pie dough makes a thick and rustic pie crust that brings out the flavors of the apples. Sorry A.T.K. I didn’t mean to doubt you. What was I thinking? Now lets talk about the filling. 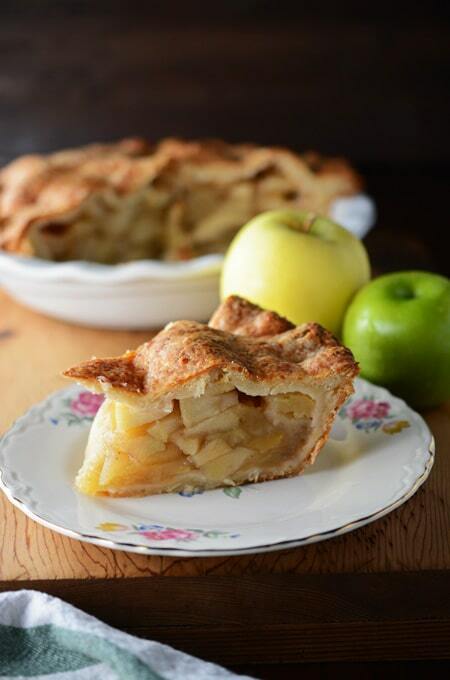 I used Granny Smith and Golden Delicious apples. 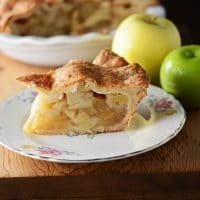 The Granny Smith apples are tart and hold their shape well, while Golden Delicious are sweeter and will break down more. You may substitute Granny Smith apples with Empire or Cortland; and Golden Delicious with Jonagold or Braeburn apples. Precooking the apples helps prevent the gap that happens when the pie crust sets. After precooking the apples we lay them out on a baking sheet to cool. This helps set the pectin so you won’t over cook your apples in the oven. DO NOT leave the apples to cool in the Dutch oven, even with the heat off. The apples will over cook and become mushy. 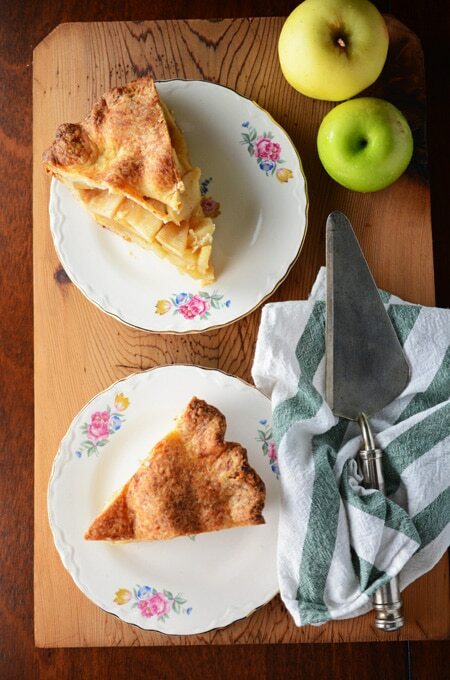 I hope you will enjoy this Apple Pie with Cheddar Cheese Crust as much as I did! You can also follow me on social media: Facebook, Instagram, Twitter, Pinterest and Yummly. Process flour, sugar, salt, mustard, and cayenne in food processor until combined, about 5 seconds. Scatter cheddar and butter over top and pulse until butter is size of large peas, about 10 pulses. 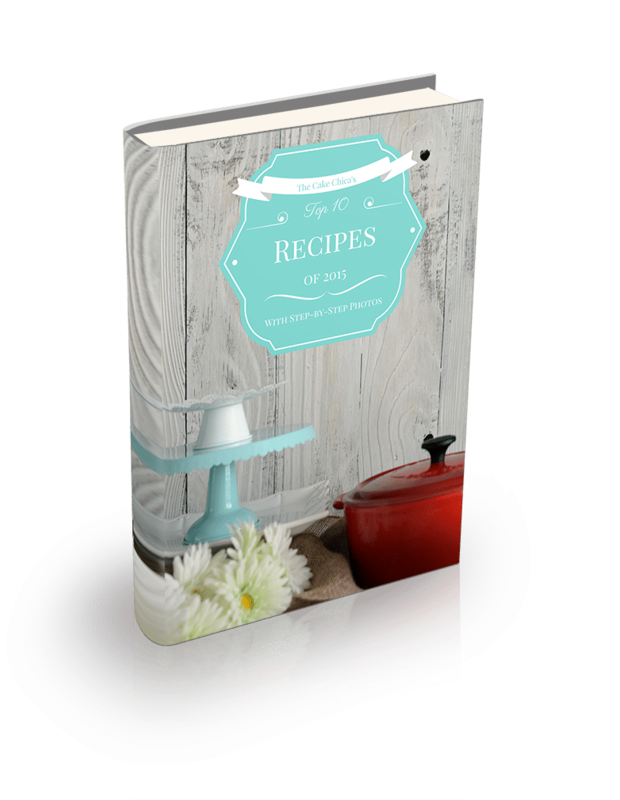 Roll 1 disk of dough into 12‑inch circle between 2 sheets of parchment paper or plastic. Loosely roll dough around rolling pin and gently unroll it onto 9‑inch pie plate, letting excess dough hang over edge. Ease dough into plate by gently lifting edge of dough with your hand while pressing into plate bottom with your other hand. Trim overhang to 1/2 inch beyond lip of pie plate. 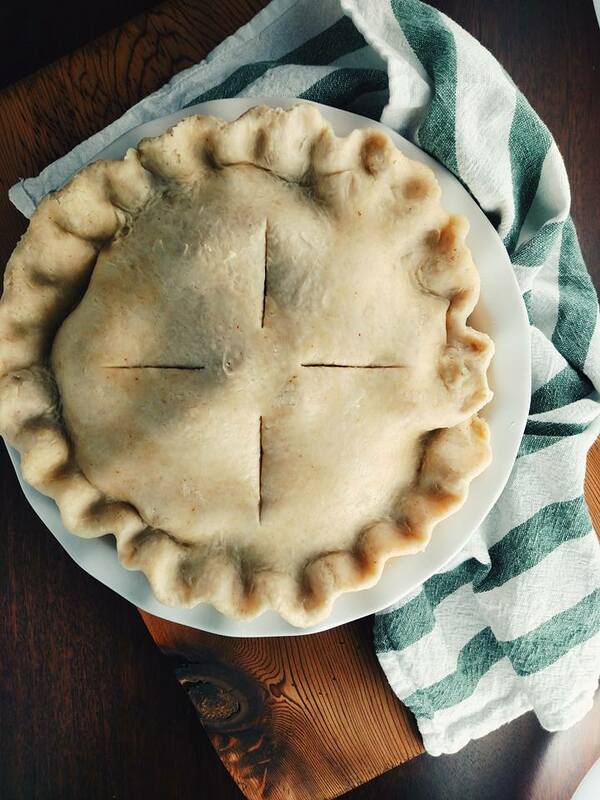 Wrap dough-lined pie plate loosely in plastic and refrigerate until dough is firm, about 15 minutes. Adjust oven rack to lowest position and heat oven to 425 degrees. 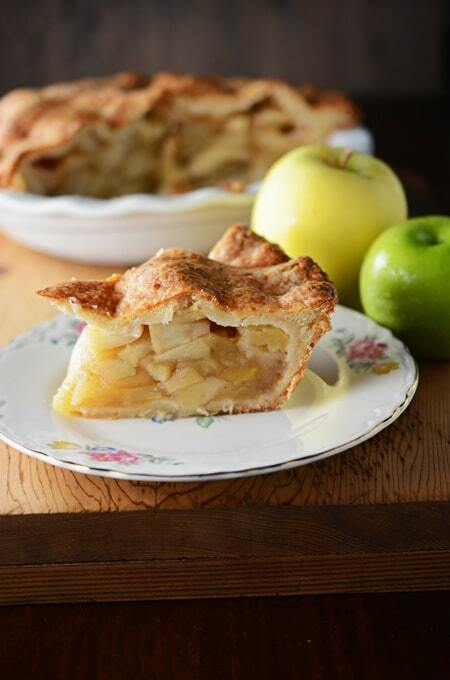 Fill pie shell with apple mixture including juices. 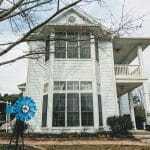 Roll other disk of dough into 12‑inch circle between 2 sheets of parchment or plastic. Loosely roll dough around rolling pin and gently unroll it onto filling.